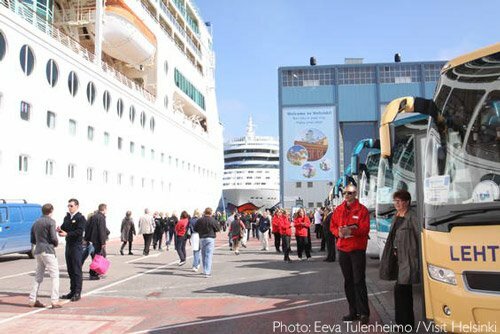 Our Helsinki cruise port guide gives you information about the docking location, cruise dock, transportation options and much more! 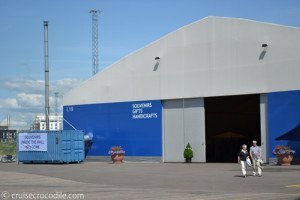 Welcome to the Helsinki cruise port guide. 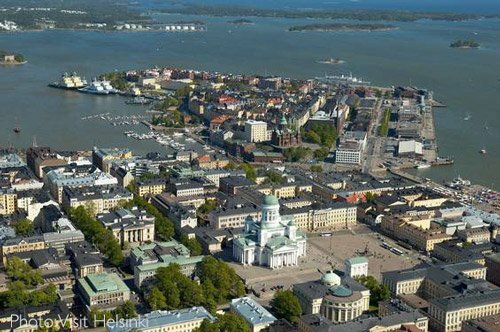 Helsinki is the capital and most important city of Finland. 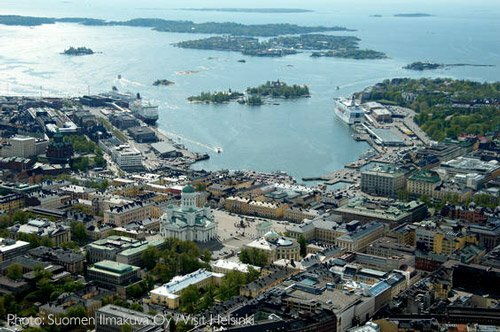 The city has 620.000 inhabitants and 1/4 the of the entire population of Finland lives in the direct area of Helsinki. It can be recognises as an international metropole with a strong small-town feel. The city offers unique architecture from Art Nouveau to Russian influences. The was the city is build up is very clever. If the Fins don’t like it they build it under the ground. Helsinki is all about looks and the city is internationally known for being of the capital cities of design. This city is the most northern port of call in the Baltic and most cruise ships come to visit in the summer time. This is when the white nights ensure just a couple of hours of complete darkness and therefore a lively happening in the city centre of Helsinki. 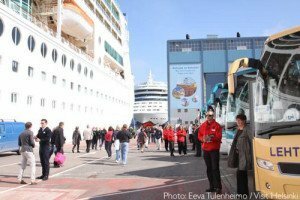 Check out the Cruise Port Guide Helsinki – Finland underneath to learn how to get around and what to do in this gorgeous city. The tourist information provides a great service to cruise passengers. They are always there for any kind of questions or information. 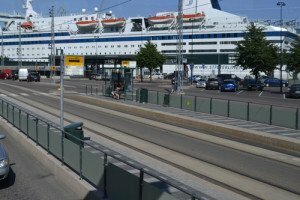 This is the Hernesaari dock where most of the big cruise ships dock when in Helsinki. Aida is one of the regulars in the port of Helsinki. Hersenaari terminal at Helsinki. This is the regular docking spots for the bigger cruise ships. This is the cruise terminal of the Melkki berth. You will find souvenir shops and tourist information inside. 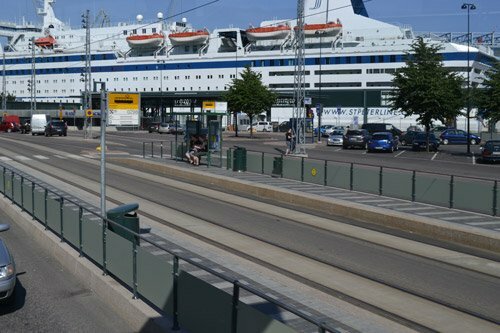 If you are docked at the Melkki quay the public transportation stop of tram tram 9 and 6T is available at the ferry terminal. This is about 10 minutes walk and this is what it looks like. 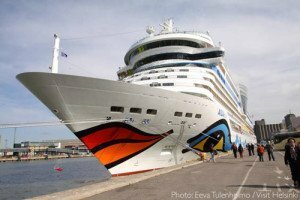 If your ship does not dock in the city centre of Helsinki your cruise line or the port should offer a shuttle service into town. 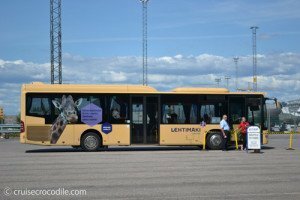 They often use the following buses for it that are wheelchair accessible. Did you know Finland has the largest number of islands in the world (over 179,550). To get to Helsinki your ship will need to pass thousands of island. Be sure to be on deck 1 hour before arrival (and visa versa) to enjoy the view over the Helsinki archipelago. How are you? – Kuinka voit? 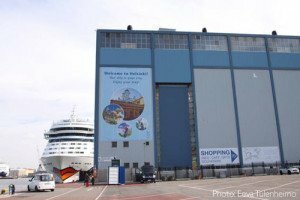 In Helsinki there are 6 different docking locations for cruise ships. 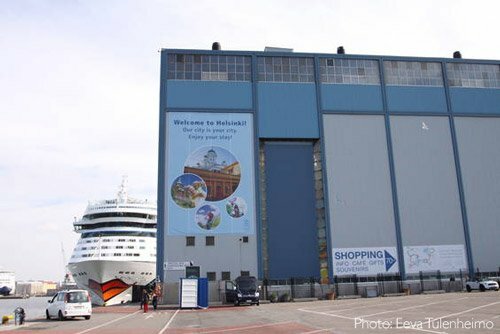 Find out through this link of the Port of Helsinki where your ship is going to dock: http://www.portofhelsinki.fi/passengers/expected_cruise_ships To avoid confusion it is best to look at the berth instead of the terminal and than look up your berth in the list underneath. This is the main spot for the bigger ships. At this large terminal you will find tourist information, a souvenir market, free wi-fi, telephone and restrooms. From Hersenaari terminal the city centre is about 10 minutes by taxi, 10 minutes by bus or 45 minutes walk. You are about 4 km away from the city centre. Bus 14 and 14X connects the terminal to the city centre. This bus comes about 2 times per hour and you can pay the driver for a ticket. There is usually also a shuttle service from the terminal to the city centre that is offered by the ship or the port. This is also a usual spot for bigger cruise ships. At this terminal you will find services like tourist information and souvenir market. From West Harbour it is about 15 minutes by taxi or 50 minutes walk to the city centre. This berth is about 4,5 km away from the city centre. At about 10 minutes walk from the terminal you will find tram 9 and 6T to go to the city centre. 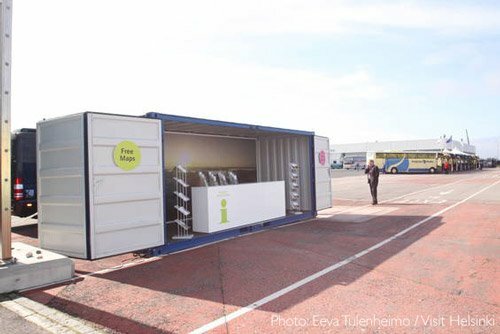 Find more information about this line at: https://www.hsl.fi/en/timetables-and-routes/terminals/harbors-connections. The cruise line or the port should also provide a shuttle service into town. This cruise dock also known as Pakkahuone Quay. This is the most ideal spot for cruise ships. This terminal is close to the city and has all kinds of facilities like tourist information, money exchange, luggage lockers and a kiosk. From the Makassine terminal the city centre is just 5 minutes by taxi, 5 minutes by tram or 10 minutes by foot. You are only 1 km away from the main cathedral. Tram 2, 3 and 1A connects this terminal with the city centre. This terminal is also an ideal spot to be at in Helsinki. At the pier you will find tourist information, money exchange, ATM, luggage storage and toilets. From the Katajanokka terminal to the city centre it is about 5 minutes by taxi, 5 minutes by tram or 15 minutes by foot. You are about 1,5 km away from the main cathedral. Tram 4 and 4T connect this terminal to the city. This cruise dock also known as Kanavaterminaali. At the pier you will find tourist information, money exchange, ATM, luggage storage and toilets. From the Katajanokka terminal to the city centre it is about 5 minutes by taxi, 5 minutes by tram or 20 minutes by foot. You are about 2 km away from the main cathedral. Tram 4 and 4T connect this terminal to the city. All the docks have public transportation that can take you to the city centre. You can pay the driver for a ticket although it is cheaper to get a day ticket out of the machine. There is a hop on hop off bus service in Helsinki. They most often come to every dock whenever a cruise ship is in town. This series of interconnected islands in front of the city of Helsinki is a historical landmark. It served as a fortress for 3 countries: Sweden, Russia and Finland. With its five miles of wall, hundreds of cannons it became the 2nd mightiest fort of its kind in Europe after Gibraltar. Take a ferry to the island from Kauppator (see location on the map above) and take a lovely and scenic stroll while learning more about the history of the Baltic. In the city centre you will find this incredible museum. It presents the very latest works in contemporary art. It currently has 8500 works in the collection. Miasma focuses mainly on words by Finnish artists as well as artists living in nearby countries. This is the most important square of Helsinki. You will find the most prominent buildings are located here including the Helsinki Cathedral. You recognise the cathedral by its tall green dome surround by four smaller domes. It is one of Europe’s finest neo-classical squares. In the middle of the square you will find a statue of Tsar Nicolas II. He was not very popular in Russia, but in Finland he was loved my many. The tourist information of Helsinki is always on the spot. 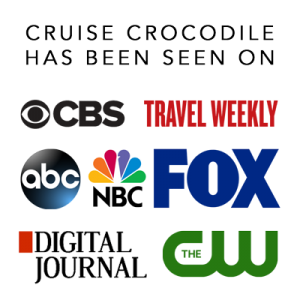 You will find several locations throughout the city and at the cruise berths where they offer their facilities. Even when you need more information and you are already in the city you can find them at their main office. This Atheneum is the basic part of the Finnish National Gallery. It houses the largest collections of art in Finland with more than 20.000 pieces or work from the 1750’s to 1950’s. This prominent cathedral sits on top of a hill overlooking the city centre. It claims to be the largest orthodox church in Western Europe. The main dome represents the sacred heart of Jesus Christ, while the smaller ones represent the apostels. It was designed by a Russian architect and the structure was completed in 1868. Over 125.000 images, 75.000 objects and 45.000 drawings make up the collection of the Design Museum. It has tons of exhibitions about Finnish Fashion, Finnish form, Ceramics, Furniture and basically anything that can explain the development of Finnish design. This stone Lutheran church is a icon landmark in Helsinki and one of the most popular tourist attraction in the city. It is visited by half a million people a year. This structure has been build straight into the rock itself which mean you will find a unique piece of architecture and great acoustics. If you here to learn about history you should visit the National Museum of Finland. It illustrates the Finnish history from prehistoric times to the present. 10.000 years of history are on display through archeological finds. This is one of the three central national museums in Finland. It is responsible for the national collection in its field. The collections include botanical, zoological, geological and paleontological specimens from all over the world. If you are the type of traveller that wants to do it independently you might want to consider taking tram 2 or 3 through the city of Helsinki. Both of these trams are ideal to take as they go all over the city centre. Depending on where you dock the tram probably will not come straight to the pier, but you can pick it up in the city centre. This is an amusement park in Helsinki just outside the city centre. You will find a great selection of fun rides, arcade and outdoor entertaining performances. On this island we can find the open-air museum. It is located on a beautiful green island in front of the coastline of Helsinki. At the museum you will learn about the traditional Finnish way of life that is displayed through cottages, farmsteads and manors of the past 4 centuries. Plan your trip to Seurasaari island with public transportation through the public transport link you can find above. You will find the Helsinki city museum on the charming Sofiankatu street in the city centre. The museum is focused on telling stories about Helsinki’s past. Their vision: Everyone has the oppurtunity to fall in love with Helsinki. At the Helsinki Olympic Stadium you will find the Sport Museum of Finland. It is a national specialised museum entrusted with the task of preserving, researching and displaying a national collection in the field of sport. Heureka is the Finnish Science Centre. Discover the exciting world of science and technology by experimenting. It has a wide range of thematic exhibitions and a permanent main exhibition. The museum is for all ages, but the focus is on children. Helsinki’s Market Square is one of the most famous spots of the city. The booths here sell traditional market foods and treats, as well as handicrafts and souvenirs. Try your local cherries, fresh shrimp or go people watching at this vibrant part of town. The Sibelius park you will find this monument that is dedicated to the world famous composer Jean Sibelius. It was unveiling in 1967. It consists of more than 572 hollow steel pipes that are all welded together in a wave-life pattern. The purpose of the artist was to capture the essence on the music of Sibelius.